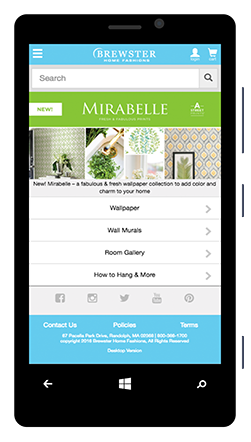 Brewster Home Fashions was looking to expand on their already successful WallPops brand to allow customers to buy their popular wall art and decal designs directly through an online ecommerce portal. Using Znode and a .Net architecture, Tallan was able to exceed Brewster’s expectations with 100% growth in visitors within the first month of site launch. Following the success of selling WallPops through their dealer network, Brewster wanted to add ecommerce functionality to the existing Wall-Pops.com Web site to connect directly with end consumers. The client needed an IT partner that could launch the new, easy to manage ecommerce site quickly while keeping initial costs down. Brewster selected Znode, a full-featured, moderately priced .NET ecommerce platform with extensible .NET architecture, easy-to-use administration web console, and full access to the platform source code. The site’s structure allows Brewster’s non-technical users to manage the site through a WYSIWYG editor within the Znode administration Web console to edit content, images, and embedded Flash animations. Within 20 person-days, the new and improved WallPops.com was implemented, integrated with third party vendors for payment processing and shipping, tested, and ready for deployment. WallPops.com had its first orders rolling in within only a couple hours of the site being live and saw a 100% growth in visitors within the first month of site launch.